But if you’re rich enough to afford a sub-$250k speed machine, there are a lot of options to choose from. These vehicles are many times better and faster than a normal sports car, and they have the numbers to back it up. Here are the top 6 supercars you can buy today for under $200k. No, this is not an error. Sports car fans are familiar with the Corvette nameplate, but why is the ZR-1 included in this list of budget supercars? To that we’d ask: what else would you call a car equipped with a supercharged 6.2-liter V8 that churns out 755-horsepower and 715 pound-feet of torque? With 600 lb-ft arriving at a low 2,000 rpm, the Corvette ZR-1 can blast from 0 to 60 mph in 2.85 seconds. Top speed is rated at 212 mph, which we assume won’t take long given the gargantuan power of the V8 motor. And unlike other supercars, the 2019 Chevrolet Corvette ZR-1 can be equipped with either a 7-speed manual transmission or 8-speed automatic. Best of all, the Corvette ZR-1 is the most affordable supercar in this list. Prices start at only $121,000. It is hard to forget the first-gen Acura NSX. It was a car developed in tandem with the late Ayrton Senna, who is unanimously the greatest and most vicious Formula 1 driver to ever roam this planet. The 2019 Acura NSX is a different sort of animal. It combines the old-school benefits of an internal combustion engine with a bevy of electric motors. The 2019 Acura NSX is powered by a twin-turbocharged 3.5-liter V6 motor and three electric motors; two in the front and one in the back. This equates to 573-horsepower and 406 pound-feet of torque. All that power is governed by a 9-speed dual-clutch transmission for a 0 to 60 mph time of 3.1-seconds and 191 mph top speed. The new Acura NSX can be yours starting at a base price of $157,000. Back in the day, only the Porsche 911 could be classified as the everyday-usable supercar. That only lasted until the Audi R8 came along. The 2018 Audi R8 shares approximately 50% of the same components as the R8 GT3 LMS race car, which equates to blistering performance. But in typical Audi fashion, the R8 remains one of the friendliest supercars to live with on a daily basis. The base model comes with a 5.2-liter FSI V10 motor that produces 532-horsepower and 398 pound-feet of torque. If you need more power, the R8 V10 plus will oblige with a 602-horsepower V10 mill. Equipped with a rear-biased Quattro all-wheel drivetrain with torque vectoring, the new R8 can scoot hurriedly from 0 to 60 mph in 2.9-seconds. Want to add the 2018 Audi R8 in your garage? As long as you have $177,000 to spend, you can. For those who miss the gorgeous Mercedes-Benz SLS AMG, the 2018 Mercedes-AMG GTR is the right car for you. The AMG GT-R is actually better because it comes with a pair of proper doors and none of the elegant-yet-silly gullwing doors of the SLS. The ridiculously long hood houses a potent 4.0-liter bi-turbo AMG V8 mill that outputs 577-horsepower. This loud and angry motor can also produce 516 pound-feet of torque from 1,800 rpm all the way to 5,500 rpm. Connected to a 7-speed dual-clutch automatic transmission, the 2018 Mercedes-AMG GT-R can propel from 0 to 60 mph in 3 seconds flat and on to a top speed of 204 mph. German high-performance metal doesn’t come cheap, but this particular coupe still lands in a sweet spot for our collection. Prepare to spend at least $157,000 for the AMG GT-R. The 2018 McLaren 570 is available in two models: the S and the GT. The S is the sportier version while the GT is the more comfortable option. It only takes a single glance at the McLaren 570S to discern that this is more than just a supercar. It has the exotic looks of a million-dollar hyper car and the engineering excellence of a dedicated performance machine. It also has the build-quality of an ultra-exclusive luxury car. The 2018 McLaren 570S is equipped with a rear-mounted twin-turbocharged 3.8-liter V8 engine. It can churn out 562-horsepower and 443 pound-feet of torque via a 7-speed automatic transmission. 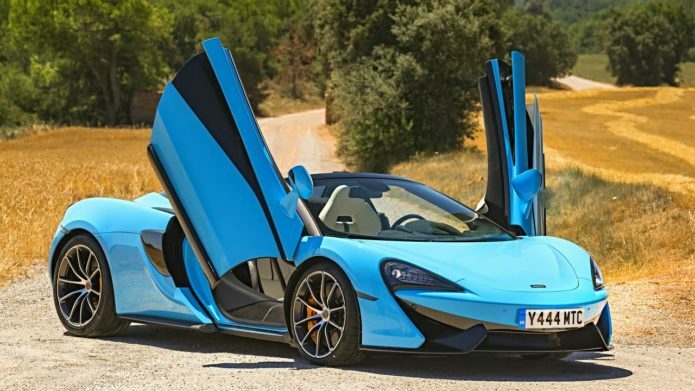 The 570S can scoot from 0 to 60 mph in 3.0-seconds and reach a top speed of 204 mph. With such dedicated performance and craftsmanship, it is understandable the 2018 McLaren 570S is the most expensive supercar in this group. Prices start at $191,000. You didn’t think we forgot about the 2018 Porsche 911 Turbo, right? The 911 remains one of our favorite supercars. It still defines the supercar standard, in fact, despite the onslaught of newer and more powerful models. The new Porsche 911 Turbo is powered by the familiar rear-mounted twin-turbocharged boxer-six motor that produces 540 horsepower and 486 pound-feet of torque at 1,950 to 5,000 rpm. Connected to a seven-speed PDK dual-clutch automatic transmission that sends power to all four wheels, the 2018 Porsche 911 Turbo can accelerate from 0 to 60 mph in 2.6 seconds. Top speed is 205 mph. The base model 911 Turbo starts at a shade under $162,000. If you want more power, the 911 Turbo S with 607-horsepower is yours for around $191k before options. We would have gladly included the Lamborghini Huracan, Ferrari 488 GTB, Noble 600, and even the Lamborghini Aventador in this list. But all of them costs more than $250k. Even the base Huracan is hovering dangerously close to the $200k mark before ticking the options box. And while “supercars” and “budget” wouldn’t ordinarily seem to go together, as our list of six shows, the sky needn’t be the limit if you’re looking for fast thrills.